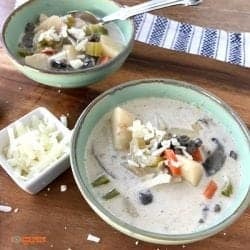 Healthy Potato Chowder with mushrooms is a creamy and delicious chowder. It is made in the slow cooker which, to me, is an added bonus. At the Feeding Big household, I feeding my family at least 2 vegetarian dinners every week is something I strive for. At first it was a struggle. My family was used to eating chicken, beef or seafood every night. I can promise you, I got a few looks when they sat down to dinner and there was no meat. I found that feeding them a meal that had hearty and filling ingredients was the best. Now, we all look forward to having meatless meals. This healthy potato mushroom chowder is filling and tastes great too. Adding my families favorite broccoli salad with tahini dressing rounds out the meal. 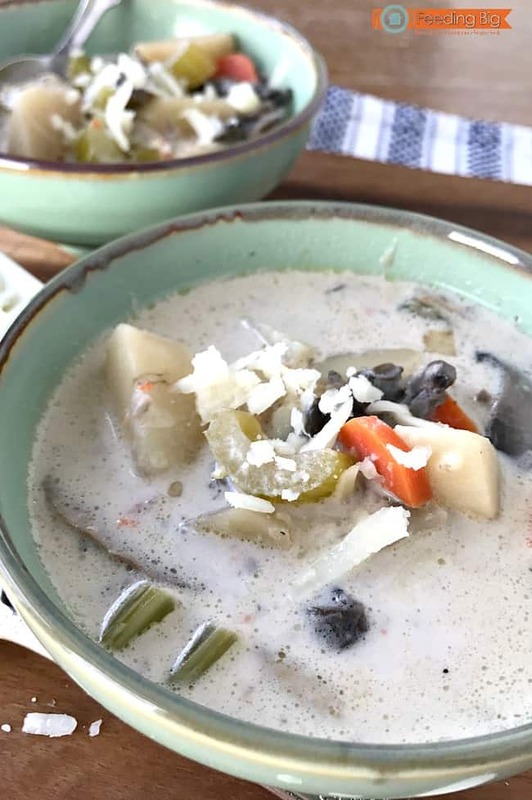 Healthy potato chowder with mushrooms is a versatile dish. The versatility of it is one of my favorite things about it. As someone who eats real food, I use whole milk when making the shower. I have actually used a combination of 1/2 milk and 1/2 half and half. The chowder is extra rich then. If your family is not fond of mushrooms, it won’t hurt to keep them out. You can easily add corn to this recipe if that is a family favorite vegetable. 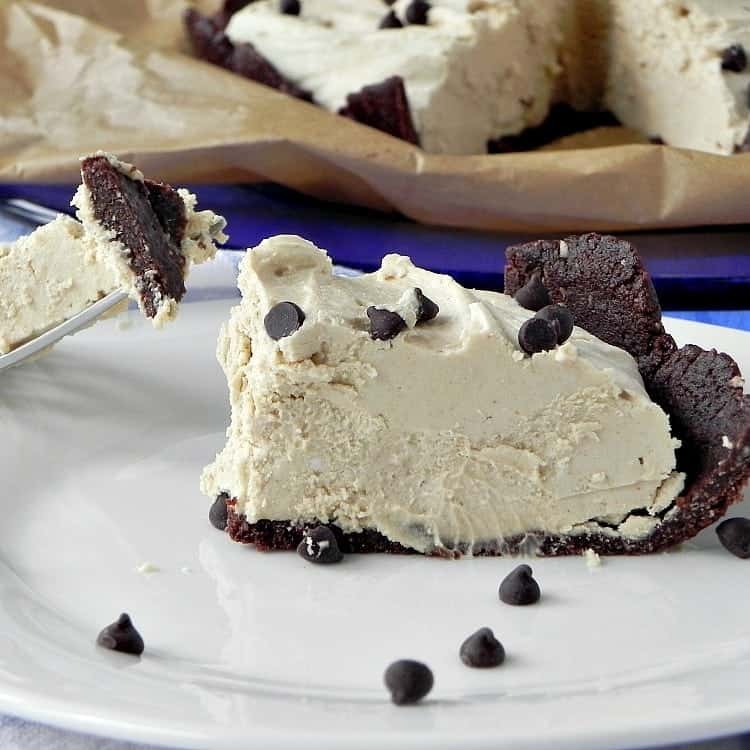 For dessert, you may want a big slice of this No Bake Chocolate Peanut Butter Pie. There is no sugar and it is made with clean eating/real food ingredients. Healthy, vegetarian slow cooker recipe. In a medium sized skillet, melt butter then sauté the onion and celery until tender. Remove from heat and add the flour, salt and pepper. Stir well and then place in a slow cooker. Add the water, potatoes, mushrooms and carrots to the slow cooker. Stir well. Cover and cook on low for 6 to 8 hours or on high for 3 to 4 hours. 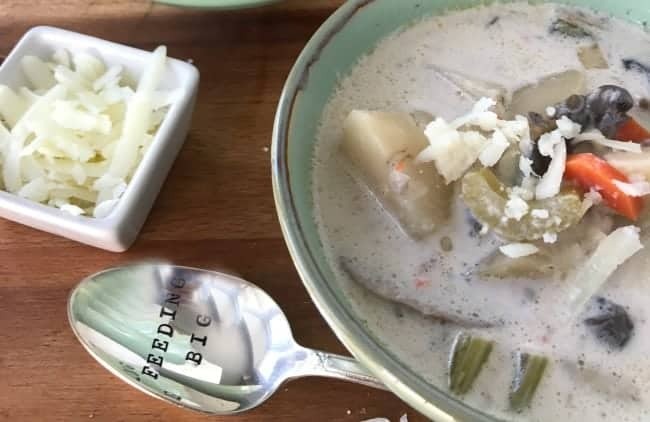 When the potatoes are tender add the milk and parmesan cheese.